Gujarat SET Exam Hall Ticket 2018: The Maharaja Sayajirao University of Baroda, Vadodara has scheduled to conduct the Gujarat State Eligibility Test (GSET) examination on 30th September. 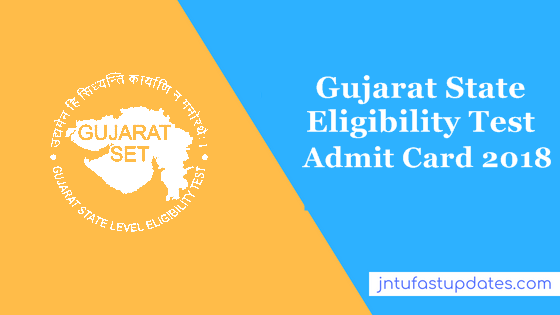 Aspirants applied for the GSET 2018, can hurry up to download GSET admit card from the official portal, gujaratset.ac.in. This examination will be attempted by a large number of applicants. And the conducting authority is going to organize the test in many examination centers across the Gujarat state. Candidates applied for Gujarat State Eligibility test can check their examination venue details from their respective hall tickets. To attend the test, candidates have to download GSET Admit card. The examination officers are going to verify the admit cards of aspirants before allowing them to the examination. Hence all the hopefuls are advised to carry the admit cards as a must while going to the examination. Applicants competing for GSET examination can check the hall ticket availability date, downloading instructions and other details from the following. The Maharaja Sayajirao University of Baroda, Vadodara has issued the official notification for Assistant Professor Vacancies recently. The application process was continued from 9th April to 31st May. A huge number of aspirants having the suitable eligibility criteria have applied for the assistant professor/lecturer posts. The screening of the candidates will be done through the written test and interview rounds. Candidates applied for the Assistant Professor jobs need to clear the Gujarat State Eligibility Test to qualify for the interview round. GSET examination for Paper 1 and Paper 2 will be organized by the conducting authority. Candidates have to qualify each round to get shortlisted for the next round. Finally, aspirants qualifying in all the rounds will get the chance to work as an assistant professor in the state of Gujarat. Aspirants applied for Gujarat SET 2018 can get the admit cards from the official portal, gujaratset.ac.in. The hall ticket/admit card will be accessible to download from 22nd September onwards. Hopefuls can get the admit cards and preserve safe to carry to the examination. Admit card/hall ticket contains the information of the candidate. Paper I – GSET Paper 1 contains 50 objective type compulsory questions each carrying 2 marks. The questions which will be of general nature, intended to assess the teaching/research aptitude of the candidate. Various questions related to comprehension, reasoning ability, divergent thinking and general awareness will be mentioned in the test. Paper II will contain 100 objective type compulsory questions each carrying 2 marks, which will be based on the subject selected by the candidate. Search the GSET Hall Ticket download link in organization website. Check the information in Gujarat SET Hall Ticket 2018.